Sculpin QA has been awarded nearly $900,000 in small business grants and loans to enhance VR technology by developing new tabletop games. The company has strategically leveraged a mix of federal and provincial funding, which will be used to hire additional support staff to develop, test, and market its newest gaming software. The contribution will be provided through the Natural Resource Canada (NRC)’s Industrial Research Assistance Program (IRAP) and the Atlantic Canada Opportunities Agency (ACOA)’s Atlantic Innovation Fund (AIF). The company will receive a combination of Canadian research grants, as well as provincial small business loans and wage subsidies. The company plans to create 13 new full-time positions and will hire producers, designers, and engineers to support VR development and marketing efforts. Sculpin QA, subsidiary of Other Ocean Group Canada Ltd., is a video game testing and development company based out of Charlottetown, PEI. The software development company has committed to providing quality jobs to talented youth through its latest project. The company is offering a new take on classic board games; government funding will be used to help Sculpin QA develop VR technology that allows virtual reality users to play table top-style board games within the virtual world. A total of $20,766 in wage subsidies provided through the provincial government’s Innovation PEI initiative. This project will allow Sculpin QA to create a new, innovative VR gaming platform, offer high-quality jobs, and boost innovation within PEI’s technology sector. Sculpin QA has successfully accessed a mix of federal and provincial government funding to support their ongoing software development project. By optimizing a funding plan, the company can maximize the impact of its latest innovative technologies. There are a variety of different government funding programs tailored to support innovative research and development activities. Research grants can be used to help businesses overcome internal technical challenges, develop new products/processes, and determine marketing best practices. Learn more about Canadian research and development funding for your innovative business projects. The federal and provincial governments both offer hiring grants and wage subsidies to encourage employers to hire students and recent graduates across Canada. By accessing government funding, employers can address internal labour and skill shortages while also gaining access to knowledgeable top talent. Learn more about hiring grants and wage subsidies to support your workforce development initiatives. 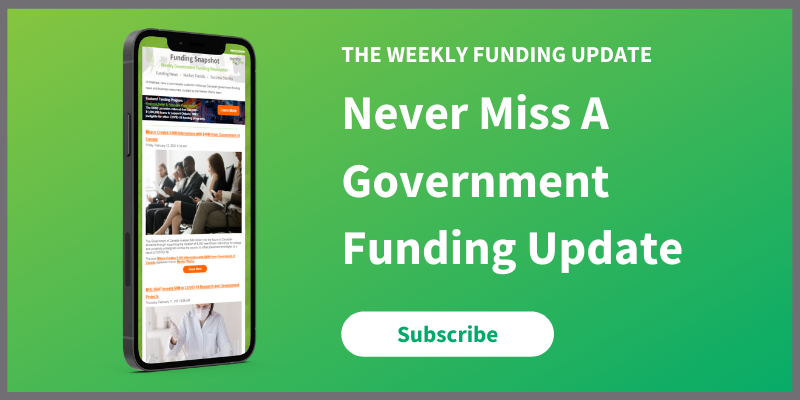 The easiest way to remain informed on Canadian government funding for your business is to sign up for Mentor Works’ Weekly Funding Newsletter. Business owners and executives should continuously look for growth and development opportunities. Canadian government grants and loans are available to help foster business growth and reduce strategic project costs. Receive weekly small business funding updates by registering for Mentor Works’ Government Funding Snapshot™ newsletter. For my own company and VR business, I’m wondering if you’ll be able to give more advices and further assist on applications for us. Let’s connect for more details if possible. Hi Angelina, thanks for your comment. I’ve passed your information along to Katlynd who will be in touch with you within 1-2 business days. We look forward to discussing your government funding potential! Jeff, could you also forward my information as well? I’m starting a company with a very unique VR project that also promotes a healthy lifestyle. Been struggling to find specific grants for what I’m creating, but I feel there is something out there that will make my dream come true. I cannot hire anyone, at this point, so my needs are strictly funding for things such as legal and marketing costs. Really hope there’s something out there to help me. Please get me in touch with someone who can advise me on this specific front. Thanks! Hi Shawne, thanks for your comment. Unfortunately there is limited funding opportunity for pre-revenue companies with no payroll employees. Typically the governments like to see your business become incorporated, hire a few employees, and show a record of profitability prior to applying for grants. I would further explore the Interactive Digital Media Fund if you’re located in Ontario though, since it does provide the potential for new digital media companies to apply. This is your best bet to access funding early in your business’ development. Although Mentor Works provides government funding support services, we are unable to help with your application because of your pre-revenue status. Feel free to come back to us and explore other funding options as you grow!